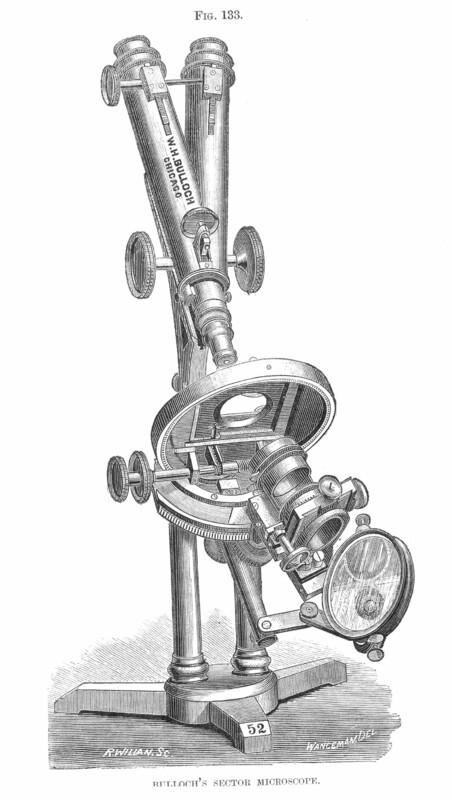 The Bulloch Sector Microscope, as pictured in the Journal of the RMS in 1880, where it was said to first have been exhibited in 1873. It is unclear from the text if this was in England or in the U.S.A. If in England, one would assume it dated to sometime before that because of the long delays in transporting such goods across the Atlantic. Note the Lister limb construction and the nosepiece fine adjustment. Also notable is the fusee chain drive for one axis of the mechanical stage.